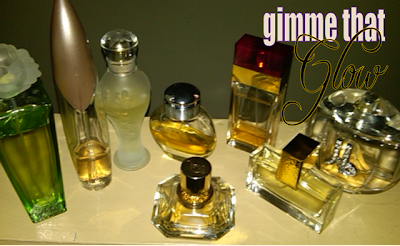 Glow Girl Weekend: Scentsational..What's YOUR Common Scents? 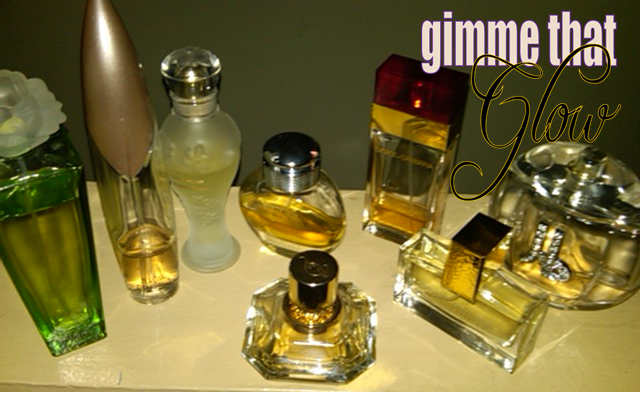 I was in my cabinet the other day and noticed I have an affinity for perfume. Hey, you can't fault a girl for wanting to smell great...but how much is TOO MUCH? YELP! I love this one because it's light but distinct. It's a nice sensual fragrance that isn't over-powering and great for everyday use. Top Notes: Lavender, Bergamot, Thyme, Mint. Middle Notes: Geranium, Sandalwood, Moss, Cedar. Base Notes: Amber, Tonka Bean. Never fails, whenever I wear this to work I always get complimented on this fragrance. I think it's the woodsy-hint of masculine scent. I like it because it borders on masculine but is all femme. I first saw this on HSN and was a little leery about purchasing something I had never smelled. When I got it-man, was I HAPPY! I wore it all that summer and then some. It's so feminine and not so floral where it's sickening but just right. It was so popular on HSN they brought it back and I was eternally grateful...because that's the only place you can really find it. I wanted something a little similar to Estee Lauder Tuberose & Gardenia but more flower focused. This smells great during the evening on a nice summers night and wears great during the day too. Strong when first applied but mellows within minutes. I bought this as part of the Christmas gift bundle from Macy's. I love the sweet subtle spicy scent. Great for everyday wear and especially evening. If you've ever tested a KLS fragrance, you know it stands out like no other. I like this unusal scent. It's oriental. It's a hint of floral. It's spicy. It's a hint of a lot of things. One this is for sure it's sensual. What first attracted me to this fragrance was the bottle. It was big and a tad bit gaudy. The salesperson was doing the usual sales pitch but the scent won me over. It's light and flirty and a tad bit playful. As you can see I enjoy a wide range of fragrances (maybe a little too much...lol) I think it's good to have variety because fragrance is a mood setter. Choosing the wrong fragrance can put you in a bad mood. Remember everyone's body chemistry is different-so what may smell great on your bestie may not smell that great on you. A couple of my precious bottles are dwindling down. I think I'm going to start looking for new one's to try. So I'll be at a fragrance counter soon with my jar of coffee beans in my handbag! What are some of your favs? Which one's should my nose choose to bring home?